A variety of frame styles, unlimited lens colors, full color printing, and intricate die cutting capabilities make it easy to create your own paper 3D custom shape glasses. For your next party favor or company anniversary celebration, how about birthday cake-shaped glasses with candles on top? Sound like fun? You can design the 3D custom shape glasses any way you wish and we will build them. 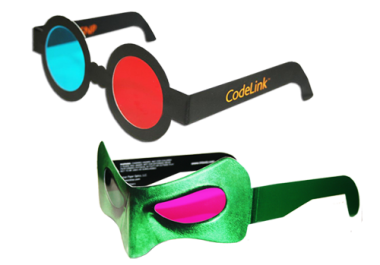 Imagine your company logo or slogan custom die-cut above the glasses frame printed in your corporate colors. Elton John never had it so good! Call for a free estimate on 3D custom shape glasses today. See our gallery below for just a few examples of the thousands of 3D glasses we have helped build for our clients!